← Are You Sitting Comfortably? It’s 6pm on April 2nd and it’s finally stopped raining! This rotten weather seems to have gone on forever, but it has kept me indoors and updating the database has been a good distraction. 1943 & 1944 updates are now complete at last. I note from the files that many of the (1300+ images were first scanned in 2015!) so it’s not a quick business cataloguing them all. 1945 will also be a long drawn out update as there will still be a large number of ads for companies only involved for the duration of the war. These will have to take a back seat for a while as my next priority will be completing the de Havilland catalogues and some long overdue amendments and updates to the Classified section of the website. 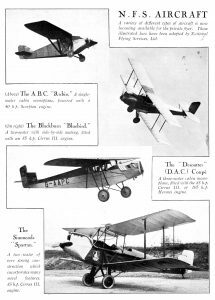 Database users will have noted that the majority of adverts are culled from the weekly magazines such as ‘Flight’ and ‘The Aeroplane’ but occasionally something interesting and unexpected appears and some interesting new examples are added to the database. 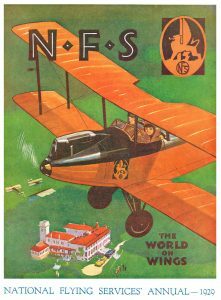 Last week I managed to find a copy of the National Flying Services (NFS) annual publication for 1929. 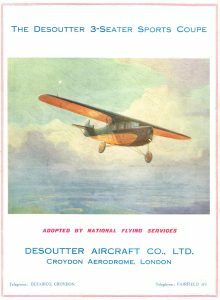 NFS was essentially a government backed scheme started in 1928 to broaden the availability of flying to those of ‘lesser means’ – their aims were widely supported by many influential people such as Alan Cobham and Sefton Branker. Their main base was Hanworth, but many other airfields operated with NFS support. As has always been the case in aviation, you can`t beat the numbers and they recorded financial losses throughout their life until in 1932 the government withdrew it’s subsidy and the receivers finally arrived in 1933 when operations ceased. Below are a few ads from the magazine to give you a flavour of their operations and the many tie-ups they had with suppliers to reduce the costs of operation. 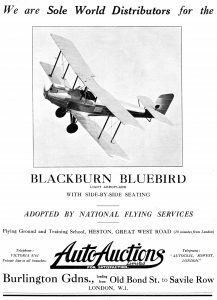 Their use of D.H.60 Moths was probably inevitable, but the Blackburn Bluebird and Desoutter (for hire and Air Taxi work) were of note. 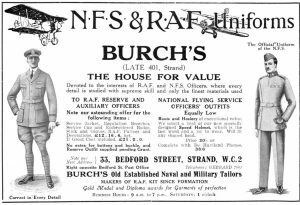 They even had a very military style uniform for staff pilots and flying instructors as this ad from Burch’s shows.